The other day one of my colleagues tweeted about the following, which he described as an ‘absolutely obscene backronym’. It was MAGIC CARPET, which obviously stands for Maritime Augmented Guidance with Integrated Controls for Carrier Approach and Recovery Precision Enabling Technologies. Well, of course, what else could it stand for? Anyway, it got me to thinking about acronyms in the defence sphere. There are hundreds of them, and even after a decade writing about it, there are still times in interviews when I have to stop the SME (subject matter expert, not small & medium enterprise, stupid!) and ask for clarification on some obscure acronym they used. 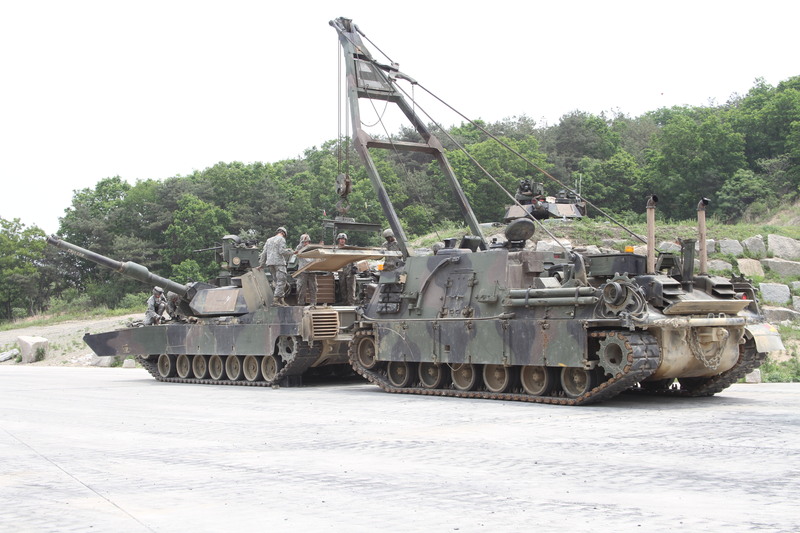 Another backronym is the pictured M88A2 HERCULES, which stands for Heavy Equipment Recovery Combat Utility Lifting Extraction System. Another long-winded one is the US Air Force’s Rapid Engineers Deployable Heavy Operational Repair Squadron Engineer (RED HORSE). One has to wonder who thinks these things up! Most acronyms we are okay with. The last decade and a half has reinforced in the public consciousness such things as improvised explosive devices (IED), to be which can be added vehicle-borne (VBIED) and person-borne (PBIED) versions. Most would also recognise the US-coined OEF and OIF too. Grammatically, however, acronyms can be fraught, and defence journals can be as guilty as everyone else. For example, there is no reason to call the above Improvised Explosive Devices. Capitalisation is quite unnecessary, because we are not referring to proper names. The same applies to UAVs, for they are unmanned aerial vehicles. Some companies don’t help things at all. Continental European companies in particular, for example Atlas Elektronik or Kongsberg just to take two names out of the hat, like to capitalise their names at every possible opportunity. This is unashamed self-promotion, because these are not acronyms at all. Some companies like to do the same with their products too. Note it is Exocet, not EXOCET. But if you’re GDLS or MBDA, then you can get away with it. MAN or ZF are not guilty either, because these are indeed acronyms. In fact, these two latter names are so firmly entrenched that most of us would be hard-pressed to identify their original/full names as Maschinenfabrik Augsburg-Nürnberg or Zahnradfabrik respectively (the latter = literally Gear Factory, incidentally). Then there are those company names that started off as acronyms – FIAT and SAAB, for example – that no longer require capitalisation. As journalists we excitedly write about SLEPs, MLUs, ASW or ASuW weaponry, and want to learn about MBTs, SPHs, IFVs and APCs. In some cases it becomes difficult to keep up – we have, for instance, FCS, GCV and now FFV as the US Army’s search for a new armoured vehicle seems set to continue until it runs out of suitable acronyms. In preparing this article I resolved one question I always held. Was it OTO Melara or Oto Melara? In fact, it is the former as OTO is an acronym for Odero-Terni-Orlando. Know of any other interesting acronym stories? Oooh! We need to know what that one stands for, Trevor! My personal favourite is the NATO ACCS programme. The NATO ACCS (Air Command and Control System) has a has a deployable air command and control system (DCAOC) and a mobile, shelterized tactical component called DARS, which is – wait for it – an acronym of an acronym: Deployable Air control center, RAP [Recognised Air Picture] production center, Sensor fusion post. Although, I suppose a purist wouldn’t call these true acronyms. My favourite was when the newly formed BAE Systems tried for BAE SYSTEMS. When technically its actually BAe anyway! One of my questionable claims to fame many moons ago was to come up with the concept of Jane’s Dictionary of Acronyms and Abbreviations. Fun project. I’m no longer with Jane’s and considered writing a new, more concise version a few months ago for private publication. My wife talked me out of it as, being military herself, she thought it would drive me to distraction. Hi Ian. I think we have a battered old copy of the Jane’s dictionary of aerospace acronyms kicking around the office somewhere. It still comes out occasionally when we get stuck.